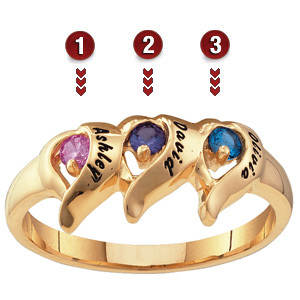 This ring combines names and your choice of a synthetic or genuine birthstone. Available in yellow or white gold. Round gemstone is 2.5mm in diameter. Ring measures about 8.5mm at the widest top measurement. Engrave up to 7 characters or spaces on both left and right sides of the ring.